a long history of fine facial foliage from Errol Flynn to Tom Selleck, Henry Wellcome to Freddie Mercury, Charlie Chaplin to Lemmy from Motörhead. How can you compete with distinguished facial hair like that? Then I looked around me and thought, what the heck, that’s not stopping anyone else. 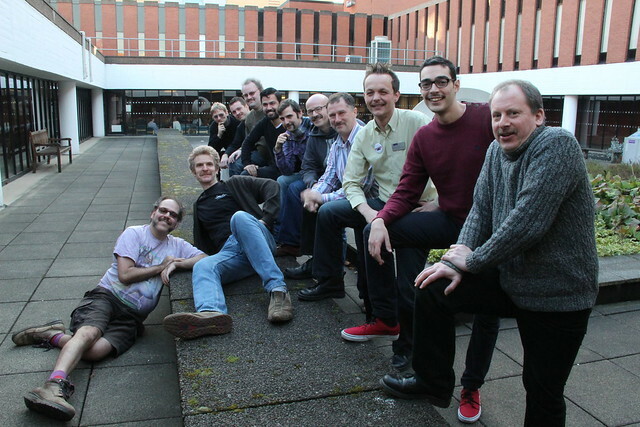 So with a few colleagues we got together and created the University of Mo-chester, CSMCR team. So far we’ve raised over £1000 for prostate and testicular cancer and you can still sponsor us. There’s a group photo of us below – you can’t actually see my moustache in that picture because it is blonde. Honest guv’. CSMCR Mo Bros, from left to right: Bijan Parsia, Sean Bechhofer, Alan Stokes, Nicolas Matentzoglu, Dimitri Tsarkov, Kristian Garza (cheating with a beard! ), Matthew Makin, Simon Harper, Jim Miles, Yours Truly, Michele Filannino and Toby Howard. Movember isn’t just about raising money, it’s about raising awareness too. If you’re a bloke, have you felt your balls lately, for testicular cancer (obviously)? Do you know about prostate cancer? With a few caveats , Movember is having a generally positive effect on human health  – and its a lot of fun too!